Alsace is the Germanic region of France. It is a region lying on the west bank of the river Rhine, between the Rhine and the Vosges mountains. To the north and east it shares a border with Germany; to the south with German-speaking Switzerland, and to the west with Lorraine and Franche Comté. Historically speaking, Alsace was part of the German-speaking area of central Europe, and to this day a large proportion of the population, of all generations, speak or understand Alsacian, a dialectal form of German closely resembling the German spoken in Switzerland. In the last two centuries, Alsace has passed from Germany to France and back , and back again; consequently, it is a region that was not part of France at the time of the makings of the modern-day nation, and has held on to a number of institutional differences, particularly concerning religious affairs. For example, Good Friday is a public holiday in Alsace, but not in the rest of France; and in Alsace, priests are paid by the state. In terms of heritage and culture, with its villages of brightly-painted steep-roofed half-timbered houses, Alsace is definitely germanic. While today people are free - within limits - to choose what colour to paint a building, in the past the colours had a significance, and town houses, which often had shops or boutiques on the ground floor, were painted according to the type of shop - bakeries in one colour, butchers in another, shoemakers in a third colour, and so on. Today that is no longer the case, but the tradition of brightly coloured half-timbered houses has become firmly established as the local Alsatian style. Alsace stands apart from any other region of France. The region's capital, Strasbourg, has all the feel of a central European city. 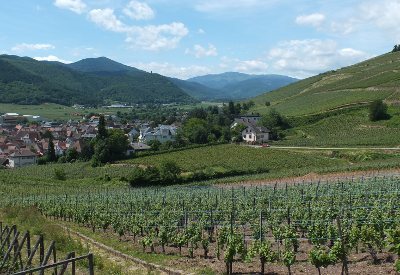 In economic terms, Alsace is part of the Rhine valley corridor, one of the most important trading routes in Europe since the Middle Ages. Consequently its economic activity has always depended as much on its Germanic neighbours as on links with other parts of France, and as a result the region has long been one of the most propserous in France. Alsace is made up of just two departments, the Lower Rhine, or Bas Rhin (67), capital Strasbourg, and the Upper Rhine, or Haut Rhin (68), capital Colmar. The biggest city in the Haut Rhin department is however Mulhouse,. Both of these departments are comprised of a rich fertile plain in the east - the flat lands of the Rhine valley - and the Vosges mountains in the west. Strasbourg itself is one of the many fine cities of France; its historic centre, with its magnificent gothic cathedral, is among the most visited in France, and the Petit France quarter, on the banks of the river Ill, is particularly worth a visit. Among the highlights of the city's year is the annual Christmas Market, held around the cathedral, an event that attracts visitors from all over France and neighbouring countries. Generally speaking, Strasbourg attracts a large number of international visitors, being the one of the two seats of the European parliament. Mulhouse is a major manufacturing centre; but with the French national railway museum and the Cité de l'Automobile, an impressive car museum with the world's largest collection of Bugattis, and also the large Ecomusée d'Alsace open-air museum, this part of southern Alsace has plenty to offer the tourist. Lying at the point on the river Rhine where France, Germany and Switzerland meet, the town of Saint Louis is actually a suburb of Basel, or Bâle in French; as such it is very close to this historic Swiss city, with its prestigious art galleries. The cities of Alsace all lie in the Rhine valley; to the west of the Rhine valley, Alsace includes the eastern side of the Vosges, a range of steep and thickly wooded mountains which offer plenty of opportunities for hiking, rambling and other outdoor activities. 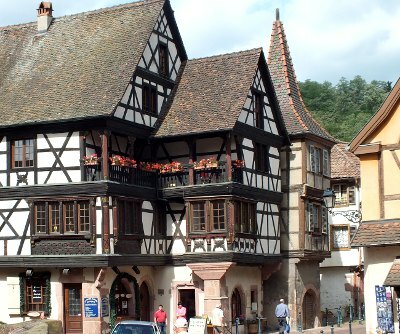 A typical traditional Alsace village. Most Alsace wines are white wines, in the German tradition; Alsace vineyards are famous for their Sylvaners, Rieslings and Gewurtzraminers, wines that are not produced anywhere else in France, but are produced in German vineyard areas. The cheaper Alsace wines are Edelzwicker and Sylvaner, the most expensive ones are the Gewurtzraminer, specially those known as "vendanges tardives", meaning late harvested grapes, which produce strongly savoured wines that are excellent as an aperitif. 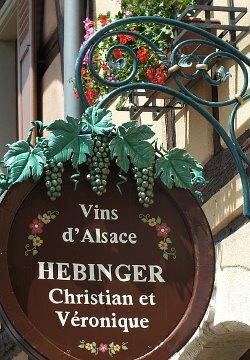 Alsace is famous for its beer (for example, Kronenbourg or Meteor), its sauerkraut (choucroute in French), and several other local specialities such as Alsace Flammekueche, a traditional dish that is not unlike a pizza without tomatoes, but covered with cheese, cream, mushrooms and local ham. Another local speciality is Alsatian gingerbread, known as Pain d'Epices. Strasbourg's Christmas market, the Christkindlmarik is reputedly the oldest and biggest traditional Christmas market in Europe. It has been going since 1570, and runs throughout the month of December. With the growing international success of the Christmas Market, other Christmas markets have developed in the other towns across the regions, notably Colmar, and in many of the traditional villages in Alsace such as Riquewihr. These attract visitors from all over Europe, and have helped boost the Alsace tourist industry in a month when tourism in other regiions is largely dormant. By TGV train from Paris gare de l'Est or from Lyon. By motorway from UK / Holland via Nancy and/or Luxembourg, from Germany via Kehl. The region's main international airport is Basel-Mulhouse Euroairport served by several airlines including BA, Swiss, Lufthansa and Easyjet. Strasbourg airport is smaller. Strasbourg. Site, historic centre, cathedral, Petite France, riverside, riverboat tours, museums, covered bridge, the European Parliament. Haut-Koenigsburg castle. Legendary hilltop castle in the Vosges, near Strasbourg. Kintzheim - the Eagle Park (Volerie des aigles), a centre for the conservation of eagles and birds of prey. 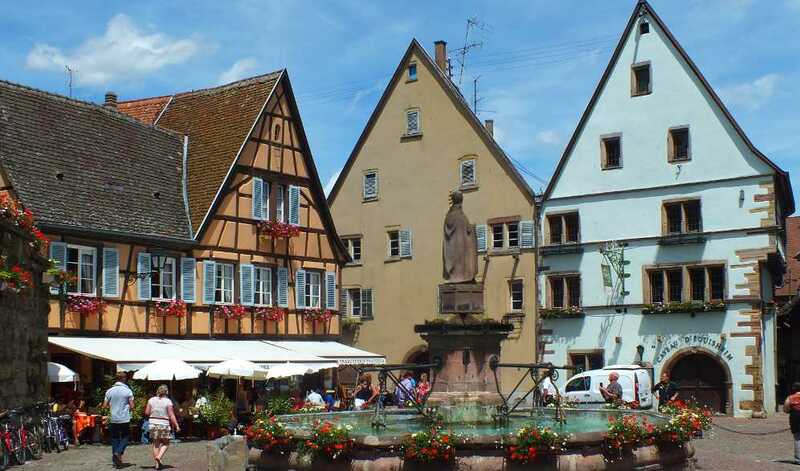 Colmar: the best preserved historic city centre in Alsace, with its half timbered houses. The Unterlinden museum, with amongst many masterpieces the Isenheim altar (16th century) by Mathias Grunewald..
Kaysersberg : classic small alsace town, with birthplace of Albert Schweitzer and Schweitzer museum. Mulhouse: The French national railway museum; the car museum. 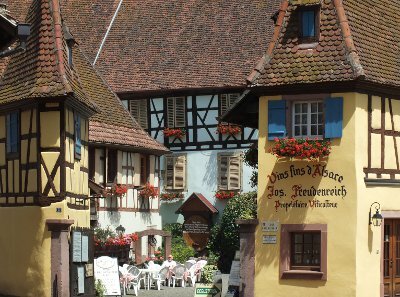 La Route des Vins: the Alsace wine trail, discovering the vineyards and wine villages such as Riquewihr, Kaysersberg, Eguisheim and many others. Riquewihr - reputedly one of the most beautiful villages in Alsace. Rather over touristic, specially in summer..
Bergheim : small town on the wine trail, completely surrounded by its 14th century walls. Ungersheim : between Colmar and Mulhouse. 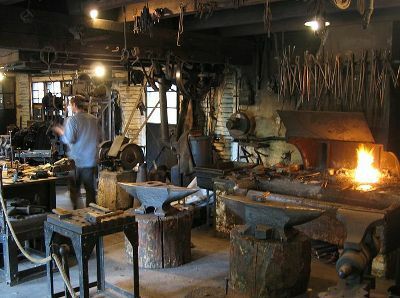 Alsace Open-Air Museum - Ecomusée d'Alsace, France's biggest open-air museum, on a par with the best. Chemin de Fer du Dollar: Dollar valley historic railway, with steam engines - southern Vosges. Neuf Brisach: seventeenth-century city, fortified by Vauban. Vosges mountains; hiking, mountain-bike trails, nature trails, skiing in winter. Switzerland: the historic city of Basel (Bâle), with its world-class art gallery. Alsace is famous for the storks that nest on church towers and other high places.